Anika Dačić graduated in Comparative Literature and Literary Theory from the Faculty of Philology in Belgrade and is currently pursuing MA in Literary and Cultural Studies. Her interests lie in social and cultural aspects of contemporary art production and she especially enjoys writing about street and urban art. Likes to knit, play adventure video games and host quiz nights at a local bar. What is the first thing that comes to mind when you think about summer? Sunbathing, listening to waves bounce from the rocks while you enjoy your drinks at the beach? Well, what if we told you that you can actually experience all those quintessential summertime delights in the indoor museum space? Snarkitecture collective worked hard recently to bring the spirit of summer into the Great Hall of National Building Museum in Washington DC. 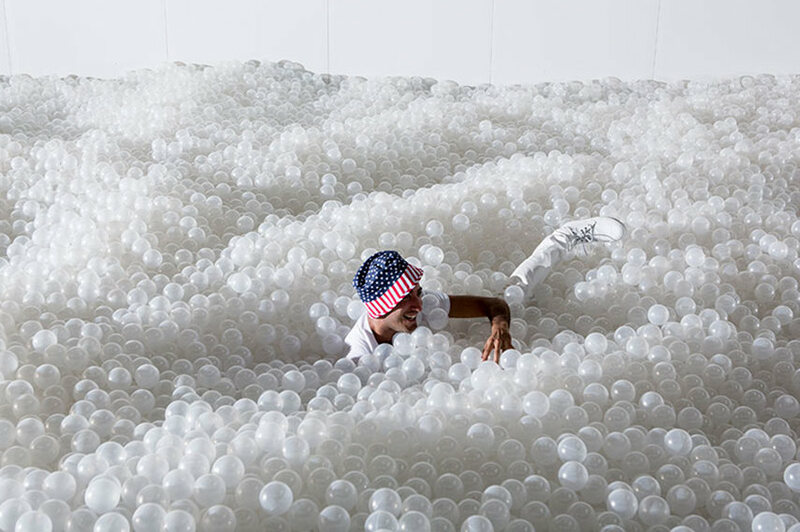 The Beach, one-of-a kind interactive installation made by Daniel Arsham and Alex Mustonen will cover the surface of more than 10 000 square feet bringing the beach resembling environment for people to enjoy and relax in. Snarkitecture collective is famous for its experimental art, design and architectural practice. Alex Mustonen and Daniel Arsham have been surprising spectators for quite some time with their original and spectacular installations. 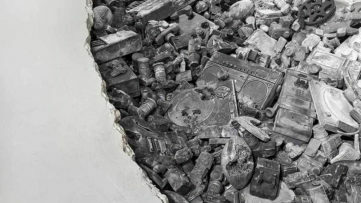 Perhaps you remember Daniel Arsham’s work from the last’s year Welcome to the Future exhibition. These artists established Snarkitecture six years ago, as an interdisciplinary project which brings original approach to architecture and design, transforming the common, sometimes ready-made objects, and found materials into unusual and extraordinary surroundings and structures. The Beach installation is perhaps one of the most demanding and ambitious projects for the Snarkitecture collective to date. 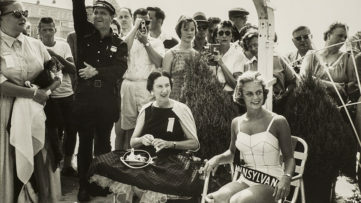 The Beach installation created for the Washington National Museum will bring an artificial environment of a seaside to the Great Hall of the Museum. 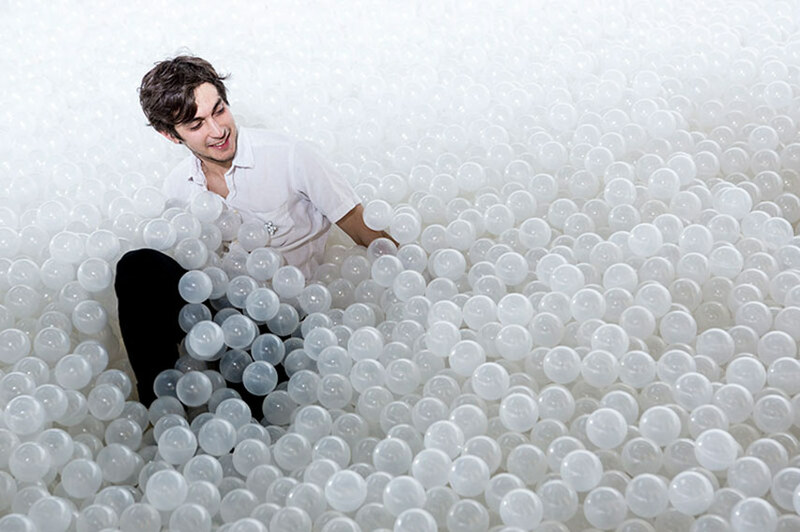 The installation is comprised of those commonly used construction materials such as scaffolding, wooden panels, perforated mesh and mirrors used for the creation of the enclosure which leads to the fake white ocean in form of colossal ball pit. 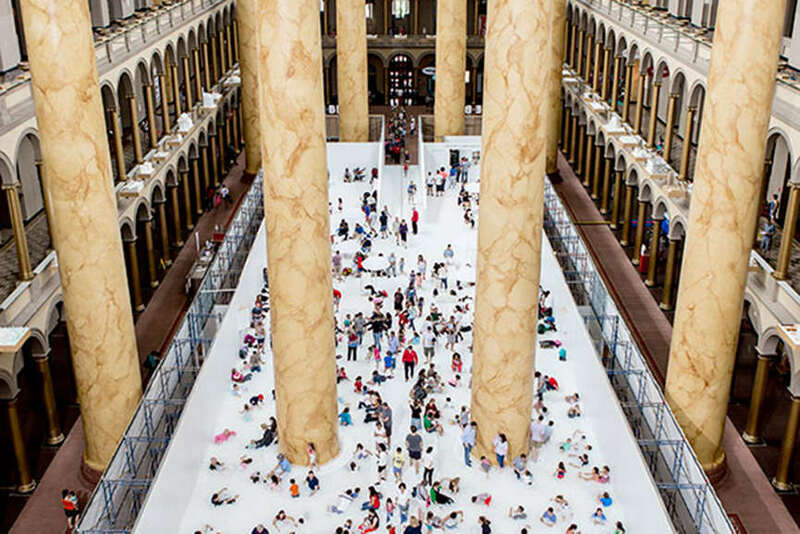 More than 750, 000 recyclable plastic balls were utilized in the creation of this interactive play-field for the visitors of the National Building Museum. 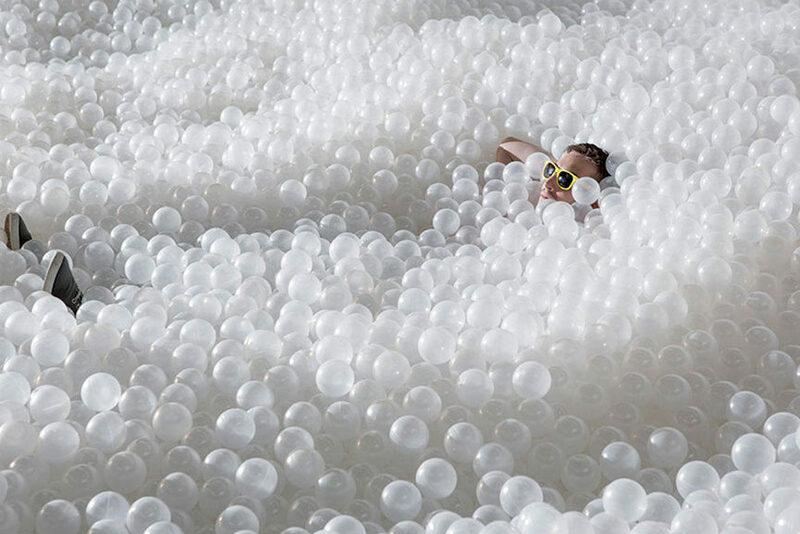 The translucent ball pool is surrounded by the imitation of a shore where people are able to sit back, relax and enjoy the beach day at the museum. All features are interactive, inviting and encouraging visitors to explore the unexpected surroundings and embrace this alternative summer experience. 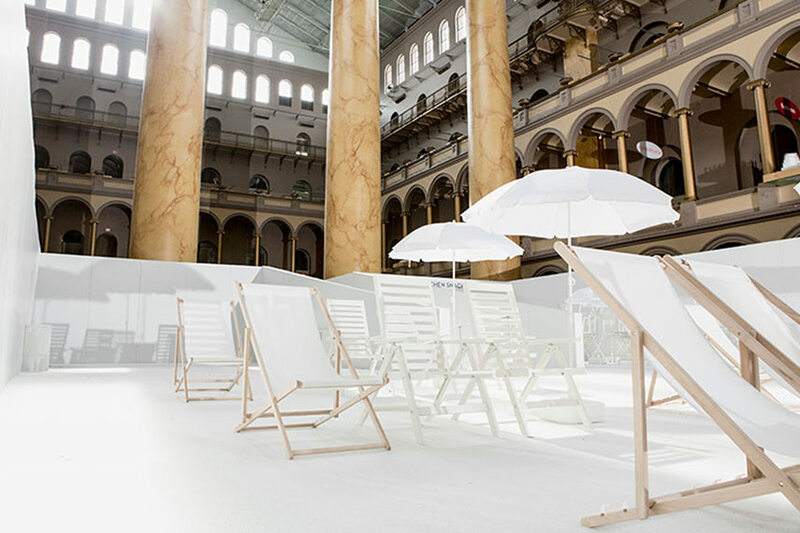 If you happen to be trapped in the city this summer, and you don’t have any vacation plans, the interactive monochromatic installation at National Building Museum might be a good chance for you to simulate all those essential summer experiences. The Beach installation allows the visitors to swim in the ocean, read a book by the shore, play paddleball and relax in this spectacular beach-like surroundings. The latest installation by Snarkitecture will stay open to the public through September 7th, 2015. 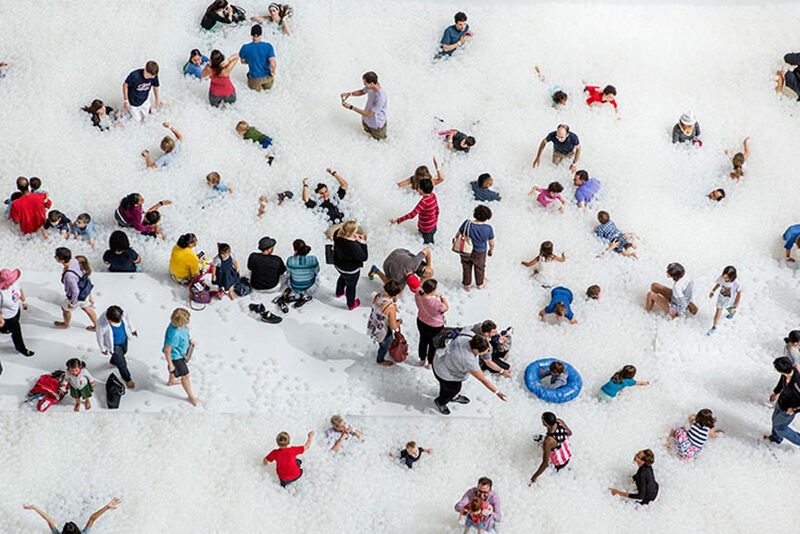 Do you like this summer intervention by Snarkitecture collective? Tell us on our Facebook Page! Sign up for My Widewalls for more artistic interventions to follow this summer. It is FREE! 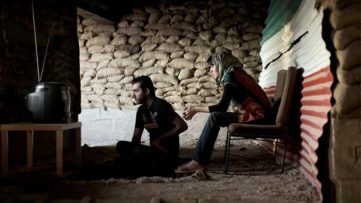 Women Photographers from Iran and the Arab World Exhibition Coming to Washington D.C.